This video shows five creative routings to allow running two to four wah pedals in parallel with Line 6 Helix. The five approaches are shown below and a download link is available for the templates. Get these and many more guitar tones and presets for Line 6 Helix at my store. I have launched my line of premium authentic artist tones for Line 6 Helix. In these premium patches I’m striving to provide the highest quality replication of your favorite artist tones as heard on your favorite songs. I have kicked off the series with two premium patches. Randy Rhoads guitar tone as heard on Ozzy Osbourne’s song Crazy Train and James Hetfield’s rhythm guitar tone as heard on the Metallica song Seek & Destroy on their first album Kill ‘Em All. You can find these and all future premium authentic artist tones on my new store site. Battery (coming soon) available now! One-dirty (coming soon) available now! FX block: Use something like a modeled distortion pedal in front of the amp. Program a switch to bump the level up as desired. This method simulates hitting the amps input extra hard. Gain block before the amp: Line 6 Helix includes a simple gain block which does nothing other than insert a clean volume control into the chain. Even though the Helix gain block provides no tonal alteration it will still hit the amp input extra hard when inserted early in the chain. Gain block after the amp: This one is very much like method #2 above. This time the gain block goes after the amp. This will create a clean boost that does not change the tonal character of the modeled amp in the Helix. You can put this near the end of the chain or right after the amp model. Put it after your delays and reverbs to have their level go up/down when the boost is switched on and off. Put it after the amp model but before any effects if you don’t want effects volume to change when the boost is engaged. 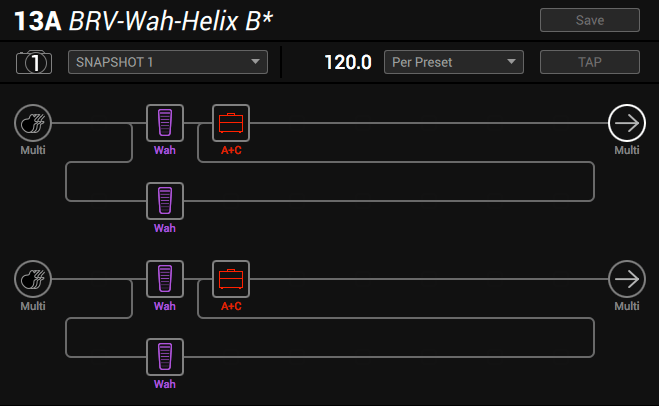 Output level: Line 6 Helix includes a volume parameter on every output assignment. 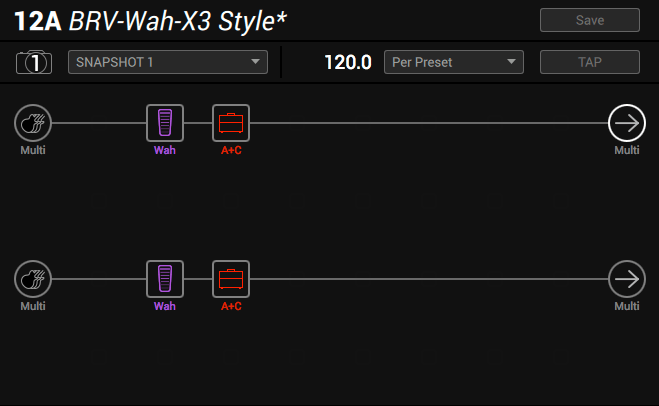 This parameter can be automated within the Helix by assigning it to a footswitch or expression pedal. Using this as a solo boost will give you a clean boost that does not alter your tone and will always affect the volume of delays and reverbs. Background music is from my Malhavok album. This small software sorts your Helix patches into directories named by what amp model(s) they’re using. 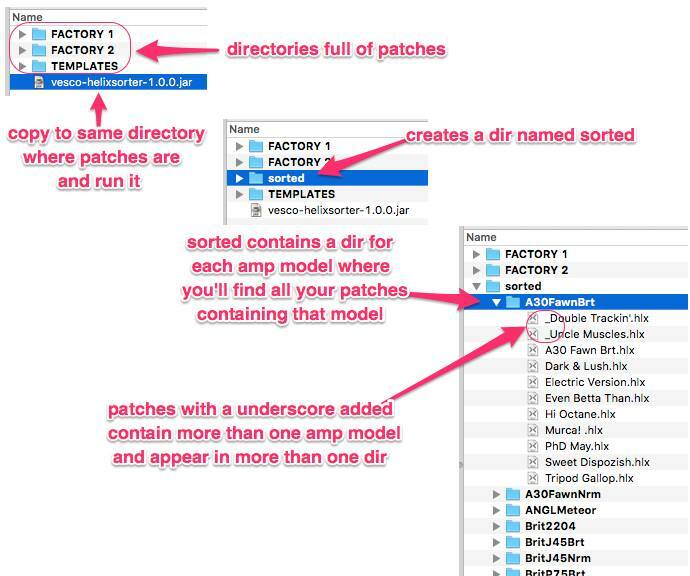 A patch containing multiple amp models will have an underscore put in front of its name and copied to multiple directories. You can always find the latest release on github. It is open source. Developer friends, I would love to talk to you and look at your pull requests! Noise gates are essential in the modern home studio. All those computers, monitors, and other electronic gear can make a lot of noise through your guitar pickups. 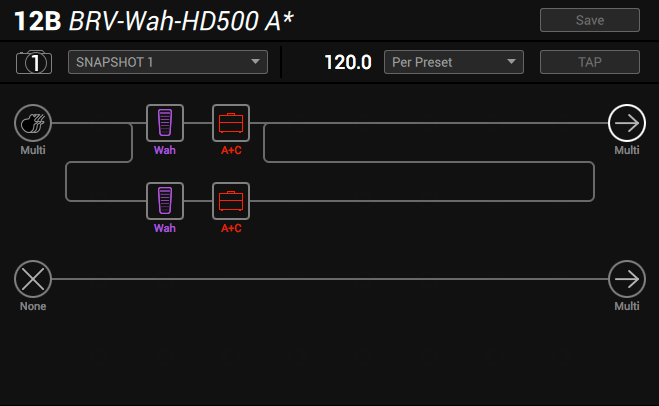 Line 6 Helix makes it easy to put a noise gate on your signal. The traditional Line 6 method is to use a noise gate effect or block near the beginning of your signal chain. This is still possible with Line 6 Helix but there’s a better way. 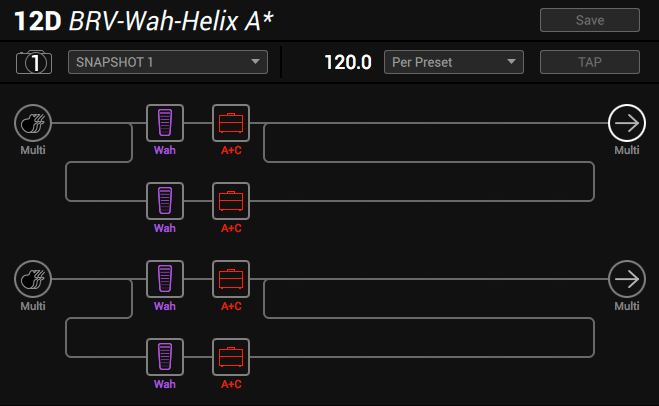 Line 6 Helix has a noise gate built directly into the guitar input block. The performance of this gate is identical to the “Noise Gate” block you can add to the processing chain. Adding the gate to your guitar input saves a Helix processing block which gives you more room for other types of effects. I doubt there’s any Helix DSP savings doing it this way. The gate sound and performance is the same so the DSP cost is likely identical. What it saves is a DSP block you could use for something else. In the video I show how to access this input gate and how to assign footswitches to turn your noise gates on/off. I have owned a Mesa Boogie TriAxis and Mesa Boogie Stereo Simul-Class 2:Ninety rig for years. I don’t use it much since I focus on the Line 6 stuff but everyone once in awhile I like to power it up and make some noise to justify still owning such a classy rig. I tried to resurrect my old Midiman Midisport 2×2 and get a MIDI sysex dump from the unit to use with an editor and bounce the sysex back to the unit for consumption. I was not able to get this entire flow working, but what I could get working is worth documenting here. This is a very old unit. It’s from before the company changed name to MAudio. I download a driver by searching this page where the most relevant OSX driver I could find was for the 2×2 Anniversary Edition and for Mac OS 10.10.1 (the driver was last updated in 2009!). After installing the driver and rebooting the 2×2 at least lit up the USB status LED. I download the free SysEx Librarian from Snoize. With the TriAxis wired up with MIDI cables to the 2×2 I was ready to attempt a data dump. I put Librarian into “Record One” mode and hit the TriAxis button combo (SHIFT+DOWN PRESET) to trigger a dump. The TriAxis manual states the operation should take only half a second after which the preset digits will blink. No blinking. I pushed it again and the program digits blinked (not the preset digits). Pressed again and the gain control flashed. Pressed once again and the preset digits finally flashed. However, Librarian showed zero successfully captured sysex messages. The TriAxis is not behaving as the manual says it should. Librarian is not receiving sysex. I have no idea if the problem is with TriAxis, 2×2, or the Librarian software itself. I gave up on this approach. All is not lost. Zip files of many presets can be downloaded from Tony McKenzie’s site. Unzip and you’ll have a collection of .TRI or .tri files. The next step is to convert these to .syx files. This is easily done with the linux `head` program. Once you have the .syx file of the presets you want to try you need a way to view the data contained within. Mark Philpot made available an easy to use online TriAxis editor. Drag’n drop your .syx file into your web browser at the indicated spot on that page. You’ll now be able to navigate to any of the presets to see the data values for that patch. It’s cumbersome to type the values in manually but at least it’s a way to get it done. The Boogie Board has a post with an alternate editor that is Windows only and may be of use to some. zip file containing all the .tri files converted to .syx format. Download these ready to use files for Mark Philpot’s site! 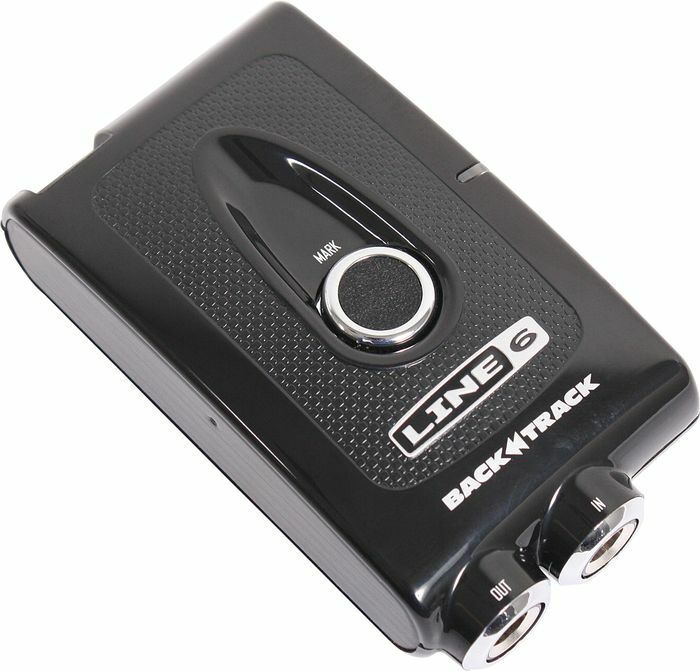 The Stupid Deal Of The Day at Musician’s Friend is the Line 6 Backtrack portable digital recorder. These things are great for capturing quick ideas with a stripped down interface that lets you focus on inspiration rather than the tools to capture it. Musician’s Friend Stupid Deal of the Day! 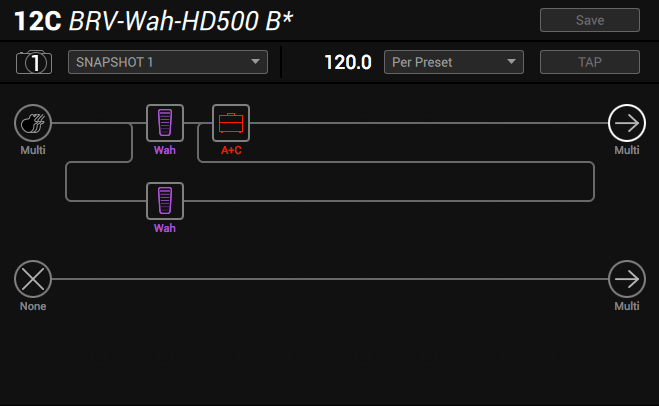 POD HD 500 does not automatically assign the toe switch for volume/wah. Here is how to set it up.